Watch a Salesforce Analytics demo now. With Salesforce Analytics, you have immediate visibility and insights into the full customer life cycle — from quotes to orders, revenues and cash — all in one system. 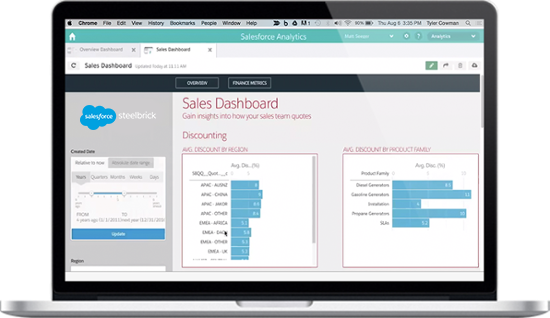 SteelBrick Analytics helps track pricing and discounting behaviors leveraging Service Wave Analytics. You can easily track key sales data such as close rates, average discounts, and average margins, and get real-time visibility into most often quoted and sold products and product combinations.